The Verdugo Basin, north and east of the Verdugo Mountains, consists of 4,400 acres and comprises 3.6 percent of the total valley fill. It is bounded on the north by the San Gabriel Mountains; on the northwest by a groundwater divide, which separates it from the San Fernando Basin; on the east by a groundwater divide separating it from the Monk Hill Subarea of the Raymond Basin; on the southeast by the San Rafael Hills; and on the south and southwest by the Verdugo Mountains. Glendale and the Crescenta Valley Water District (CVWD) have appropriative and prescriptive rights to extract 3,856 and 3,294 acre-feet per year, respectively, from Verdugo Basin. Glendale has never pumped its full water right from this basin, but has recently rehabilitated an older existing well and constructed a new well in this basin in an attempt to pump its full rights in the future. 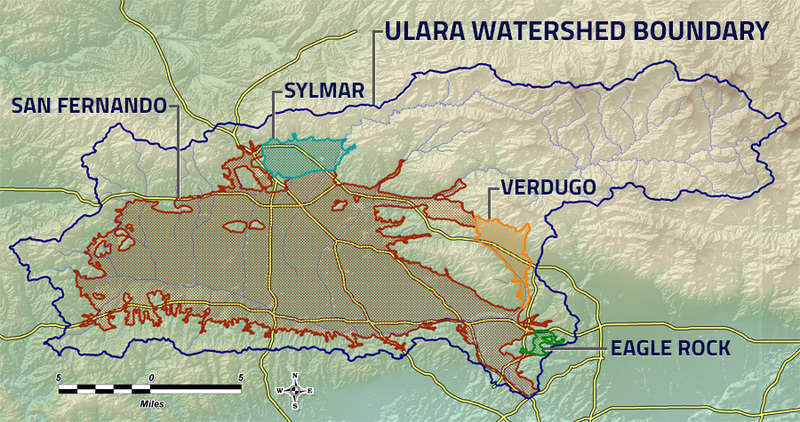 There are no provisions in the Judgment to allow for Stored Water Credits in the Verdugo Basin.